The epiglottis is a flexible flap at the superior end of the larynx in the throat. It acts as a switch between the larynx and the esophagus to permit air to enter the airway to the lungs and food to pass into the gastrointestinal tract. 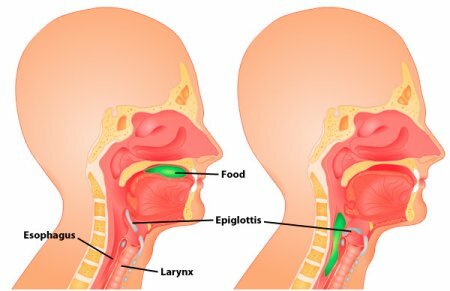 The epiglottis also protects the body from choking on food that would normally obstruct the airway. 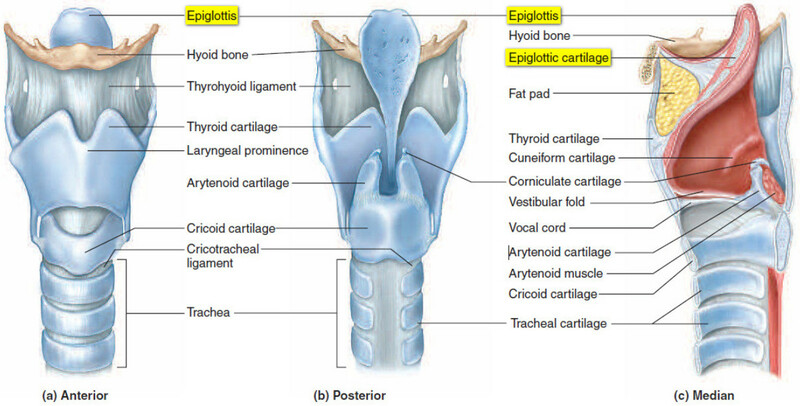 The epiglottis is a thin, leaf-shaped structure at the superior border of the larynx, or voice box. In its relaxed position, the epiglottis projects into the pharynx, or throat, and rests just posterior to the tongue. Viewed from the posterior direction, it is shaped like a teardrop with a wide, rounded region at the superior end and a narrow tapered point at its inferior end. The epiglottis is also concave with the lateral edges pointing posteriorly. Two tiny ligaments - the thyroepiglottic and hyoepiglottic ligaments - hold the epiglottis in its resting position in the throat. The thin thyroepiglottic ligament connects the inferior point of the epiglottis to the thyroid cartilage of the larynx, while the hyoepiglottic ligament connects the anterior surface of the superior region to the hyoid bone. The epiglottis is made of elastic cartilage covered with mucous membrane. Its anterior surface consists of nonkeratinized stratified squamous epithelium that is consistent with the tissues of the mouth and pharynx. On the posterior surface, it is covered with pseudostratified columnar epithelium that is consistent with the tissues lining the larynx. Under the epithelial layer is a thin layer of areolar connective tissue that provides a loose attachment for the epithelium and supplies it with blood vessels and nerve fibers. 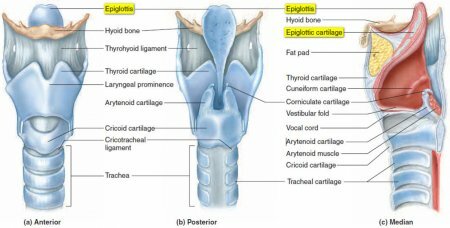 The deepest and thickest layer of the epiglottis is the elastic cartilage layer, which consists of a gel-like matrix and many elastin protein fibers. Elastic cartilage gives the epiglottis a firm, yet extremely flexible and elastic structure. Throughout each day, the epiglottis spends the vast majority of its time relaxed at the superior edge of the larynx just posterior to the tongue. In this position, air is able to enter the pharynx from the nose or mouth and pass freely into the larynx and onward to the lungs. It is only when we swallow food or drink that the epiglottis moves and performs its vital function. The process of swallowing is a complex process involving many structures in the head and neck. During this process, the pharynx, hyoid and larynx are pulled superiorly to allow the pharynx to widen and receive the material being swallowed. The movement of the hyoid allows the wide superior portion of the epiglottis to fold down on top of the glottis of the larynx, covering the opening of the airway. Food entering the pharynx passes over the anterior surface of the epiglottis, which forms the roof of the glottis; the food continues into the esophagus located just posterior to the pharynx.